Bullying meet high tech science fiction in this mysterious adventure tale! Fifth grader Tamaya Dhilwaddi only followed her friend Marshall Walsh on a shortcut home through the woods out of a sense of loyalty and obligation. She had no idea the troubles their actions would stir up in their sleepy Pennsylvania town. 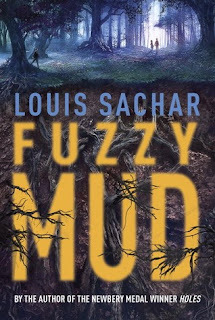 Like his Newbery Award winning Holes, Sachar uses multiple points of views and varying timelines to add intrigue and suspense to this growing crisis of a tale. Zany scientists and a bully with his own secrets lend additional layers. This quick read will keep you engaged and can also serve as a springboard for discussions about environmental issues and the role of technological innovations.